Beige and brown, not exactly the colour of choice for many system builders in 2018, but that doesn’t deter Noctua from using this colour scheme which many regard as ugly. However, regardless of the colours used, Noctua are very well known within the cooling industry for incredible performance and no-compromise research and development ethics; it could be argued that no other company goes to such lengths to design cooling fans. 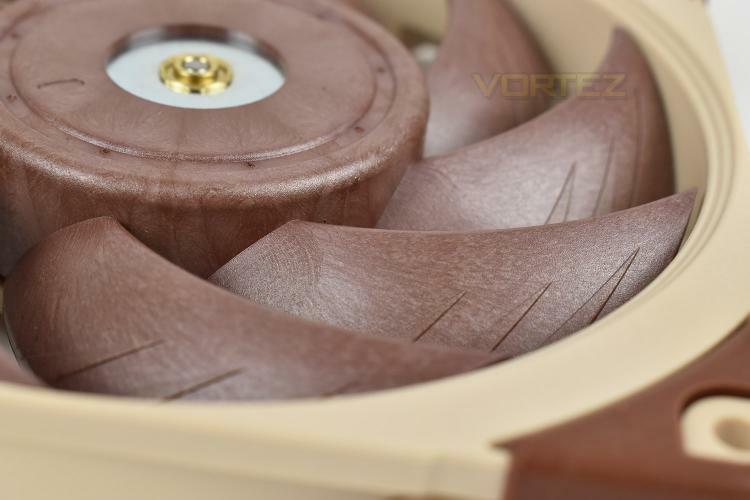 At the start of May, Noctua unveiled four and a half years’ worth of design, testing and development, amounting to the release of a single 120mm fan. That’s an awful lot of time and money invested into something as simple as a motor and some blades; but the Noctua isn’t just that. The NF-F12 and NF-S12A fans set an incredibly high benchmark for Noctua to beat, receiving hundreds of awards and recommendations. So Noctua set about beating their previous attempts with the goal of creating their greatest fan to date. The FN-A12x25 uses an ultra-tight tip clearance on the edge of the blades, running only 0.5mm from the inside of the frame, requiring new engineering techniques to be employed. This helps to reduce back pressure by allowing the air nowhere to go other than forwards, affording a more efficient fan. There’s also flow acceleration channels, a solid steel and brass hub structure, stepped inlet design and loads of other technologies employed to ensure this fan is as good as currently possible. The 120mm fan operates between 450RPM and 2000RPM via 3 different connectors, depending on the model you choose, with a supposed maximum noise of 22.6 dB (A) @ 2000RPM. The three models available are the PWM (Pulse Width Modulation), FLX (with 3 different hard-wired speed options) and ULN (An ultra low noise adaptor is included when acoustics are the priority). There’s no questioning whether or not Noctua have presented to us a fan with significant investment so let’s find out how it performs in our tests. If you can get past the colour scheme and accept it for what it is, perhaps the Noctua can help reduce your temperatures and noise at the same time.